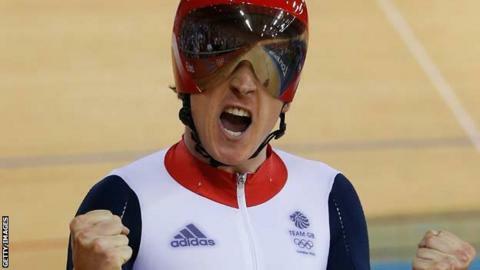 Geraint Thomas has become the first Welsh competitor to win an Olympic gold medal at London 2012. The 26-year-old cyclist from Cardiff won the team pursuit alongside Peter Kennaugh, Ed Clancy and Steven Burke. Thomas, part of the winning GB team four years ago in Beijing, becomes only the fourth Welshman to win multiple Olympic gold medals. And he joins Paulo Radmilovic and Richard Meade as a gold medallist at successive Olympic Games. Radmilovic won water polo and swimming gold at the 1908, 1912 and 1920 Games, while equestrian Meade triumphed in 1968 and 1972. Hugh Edwards, a double Olympic rowing champion at Los Angeles in 1932, is Wales' other multiple gold medal winner. Chris Bartley had been tipped to be the first Welshman to win gold at London, but the rower from Wrexham had to be content with silver in the lightweight four on Thursday. That left Thomas to carry the gold medal hopes at the Velodrome on the seventh day, and he did not disappoint as the GB team demolished Australia in the final. They led from start to finish and broke their own world record in a faultless display, clocking three minutes 51.659 seconds over the 4000m. After the race, Thomas revealed he had been ill in the lead up to the Olympics, saying: "Mentally it's been really hard to get back to where I was. "Without out these boys I couldn't have done it. The boys were superb and the crowd is unbelievable - my ears are ringing." With a second gold medal secured, Thomas is now set to leave track cycling to concentrate on road racing. He sacrificed competing at this year's Tour de France to concentrate on becoming an Olympic champion, a decision that has now been vindicated by his record-breaking performances.